Regional trails connect people and places and provide access to views, green spaces, and experiences that both calm the mind and invigorate the senses. One great example of this is the Foothills Trail, which goes through both King and Pierce Counties. 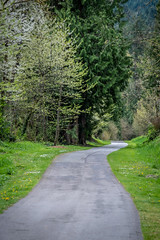 Once completed, the Foothills Trail will be a 21-mile-long, paved, non-motorized path for biking, walking, running and more, connecting some 240,000 residents of Enumclaw, Buckley, South Prairie, Orting, and Puyallup…all under breathtaking views of Mt. Rainier. The trail is currently developed in Enumclaw and in Pierce County, with a newly completed segment slated to open in Buckley in May. However, there’s approximately a one-mile-long undeveloped gap between Enumclaw and Buckley that dead ends at the White River. This undeveloped portion is managed by King County Parks. And the good news is…we will begin construction later this year to pave the trail and construct a new trail bridge over the White River, connecting the two sections across county lines! When we complete our project, people on the Foothills Trail will enjoy scenic water crossings over the White River and Boise Creek, along with access to the extensive trail system in Pierce County. And in addition to providing recreational opportunities, the new bridge will be structurally sized to accommodate emergency vehicles in the event the nearby SR 410 highway bridge is closed due to an emergency. The new bridge could serve as an alternative crossing during a catastrophic event and save emergency responders in the Buckley area from taking a 60-mile detour to the nearest hospital in Enumclaw. This project is made possible with funding from the 2014-2019 King County Parks, Trails, and Open Space Replacement Levy, as well as from a grant from the state Washington Wildlife and Recreation Program and a donation from the Foothills Rails-to-Trail Coalition. We’re excited for the next step in this trail’s development, and we know you are too – we received more than 20 letters expressing support for our project from local governments and community groups! To learn more about the project, visit the Foothills Trail Project page and sign up for Regional Trail Alerts. Also, get out and visit the trail! Previous Post Hold the phone! Thanks to a partnership with Forterra, a 155-acre Enumclaw foothills property will now be preserved. why do you keep promoting “paved trails”? Paved trails are merely sidewalks. How about more info on unpaved, i.e., “Real Trails”!? Hi Alan, thank you for your opinion. King County Parks has made it a priority to expand our Regional Trail System of paved, multi-use trails to increase access for all ages and abilities to these amazing recreational opportunities. This will increase the health and well-being of more people throughout our county. These trails also provide a much-needed corridor for alternate transportation via bicycle commuting, relieving road congestion and reducing the amount of pollutants in air from automobile commuters, providing cleaner air to our diverse communities. We understand that access to natural, dirt trails is also of value to many community members, and we are taking strides to increase the amount of dirt trails for walking, hiking, equestrian use, and mountain biking. We hope to keep expanding recreation options for everyone! I am so excited that we will finally be able to walk or ride safely from Enumclaw all the way to Sumner. Thanks you!